What’s a bathroom without a mirror? In our book, they are just as important as sinks, toilets, cabinetry or shelving and shower tub enclosures. Most people like placing the mirrors over the sink or on the back of a door, but you don’t have to stick with convention. Consider putting them above the toilet and towel racks too. Living room walls certainly deserve great mirrors as well. Consider placing a large one behind the sofa, above the fireplace or opposite an entrance door. Gallery walls outfitted with mirrored tiles would also undoubtedly work well in some situations. The bedroom is not just for sleeping these days. It’s also used for everything from getting dressed to lounging around and reading the Sunday paper. That said, why not outfit a wardrobe or chest of drawers with mirrors? Full-length mirrors placed near a closet, bench or overstuffed chair would make a practical addition to a bedroom design too. Oftentimes, stair hallways can be hard to decorate. We’d suggest that you consider creating a salon-style arrangement of framed mirrors or frames made with small, mirrored tiles. They’ll surely help brighten up the spot significantly and add a good bit of visual interest. Finally, don’t forget about your home’s sunroom or outdoor porch. They could benefit from mirrors as well. Think about placing the mirrors in areas that are likely to reflect the outdoors or the most natural light. If you have lighting and ceiling fans in those rooms as well, consider placing mirrors around them too. To learn more about adding a variety of mirrors to your home or business, please contact us. 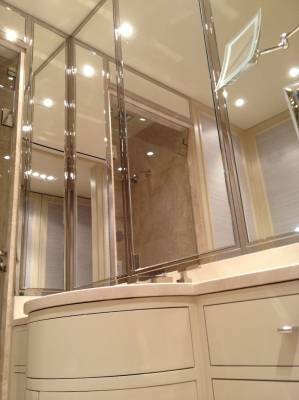 We offer complimentary consultations and specialize in mirror fabrication and installation.